We are embarking on an exciting new initiative to bring our model of providing peer support to the inner city of Miami. Although historically our CBC model has focused on loss due to death, for this initiative, we are broadening our work to include loss in general. We know that loss comes in many forms. All of which can so deeply impact a child, family and community. With our broader vision of offering peer support for loss, kids and families that are struggling with an absent parent, loss of a home, frequent moves, incarceration and instability can find support in sharing with one another. Our engagement with the Overtown/Liberty City communities involves gaining their trust and acceptance. To this end it is imperative to work with existing community organizations. 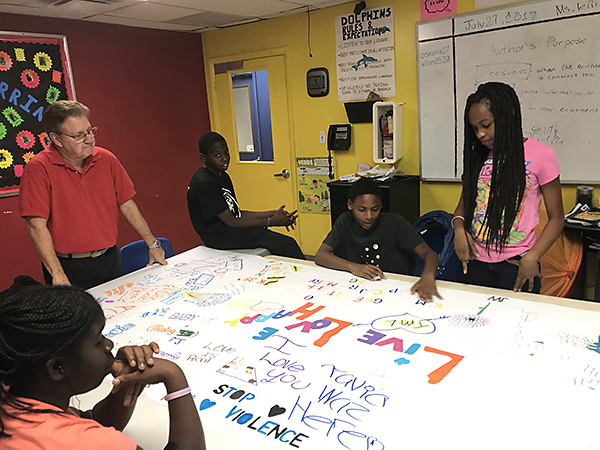 Throughout the summer we worked closely with Touching Miami with Love to provide staff training and experiential groups as well as peer support groups for the kids participating in their summer programs. We learned that the kids are so very open to sharing their life experiences when given a safe and supportive environment. With our 18 years of grief group experience, we are ready to meet the needs of the broader community by giving them what we know how to do …. Offering a safe, consistent space where kids and adults can feel the comfort of others and find hope in the wake of loss.